You can WiFi video to the sideline with Game Data Live for under $600 assuming you have two iPads. Pictured above are two iPads, IOGrapher cases for an iPad and for an iPhone 6 Plus, a router with a flash drive inserted, a directional access point with a power over ethernet injector and a power strip. Game Data Live requires iOS 8.0 or newer. Game Data Live will run on any iPad 2 or newer. Game Data Live for iPhone is intended for the iPhone 5 or newer. Some iOS devices support WiFi using MIMO or 802.11 AC. Both provide faster video transfers. Larger devices seem to WiFi faster than smaller ones. Some iOS devices have cameras that Zoom and some have Focus Pixels for smoother autofocus. Cameras with more Megapixels provide sharper images and better zoom. The newer devices with 12 megapixel cameras work the best. Use your best iPad / iPhone to shoot the video. Every other device on your network depends on it. Game Data Live for iOS can use a game controller to control video playback. Game Data Live for Macintosh requires Mac OS X version 10.10 or newer. Game Data Live for Macintosh can use a game controller to control video playback. Macintosh computers provide more ports than an iPad. They are easier to use with wired networking. A Mac can be connected to a TV, a power cord and wired networking simultaneously. You will get better video if you capture it with a Macintosh and a Magewell framegrabber connected to a HD video camera. A video camera has much better zoom than the cameras in an iPad or iPhone. This is especially useful when you are filming from the end zone. The Macintosh compresses the video, so you will need a modern Mac with lots of processing power and a fast hard drive. 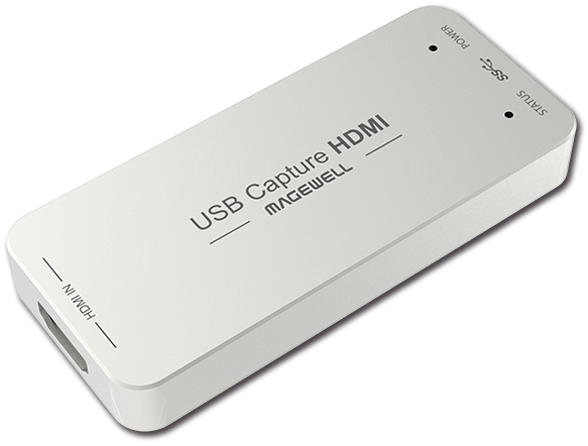 The Magewell "USB Capture HDMI" connects to the Macintosh using a USB port. A USB-3 port works much better than a USB-2 port. The connection to the video camera is HDMI. 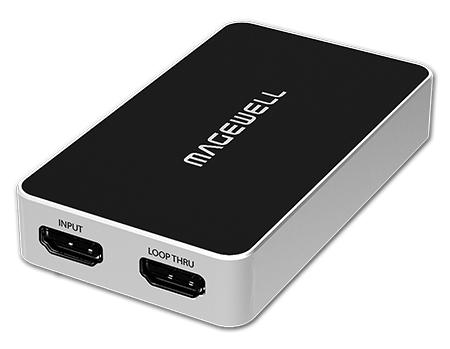 We actually use a Magewell "USB Capture HDMI Plus" which has a second HDMI loop through port. We use a dedicated wireless router at our stadium and at away games. 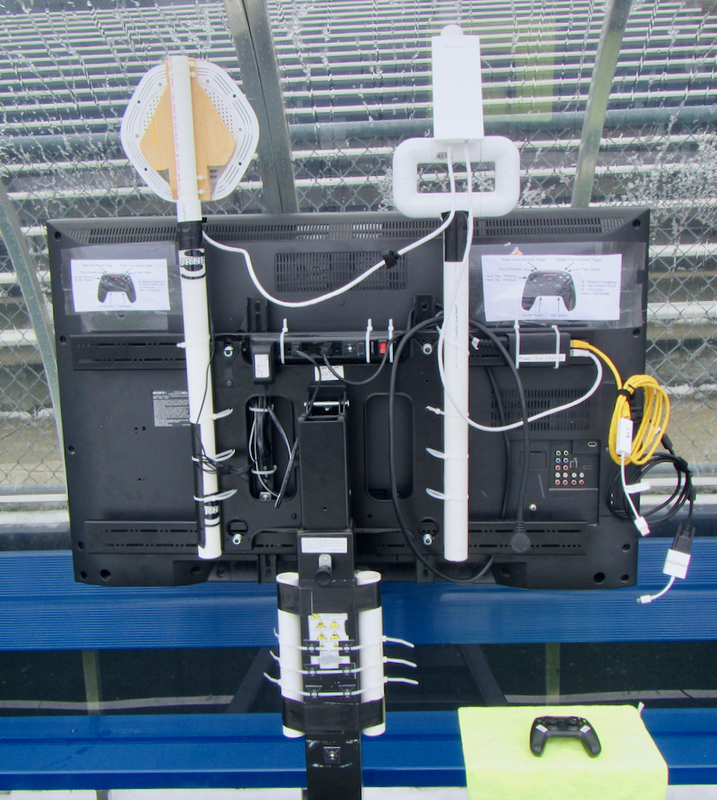 The router helps send messages from device to device and provides the WiFi signal within the pressbox. We use the 5 GHz band. We get better throughput at 5 GHz. 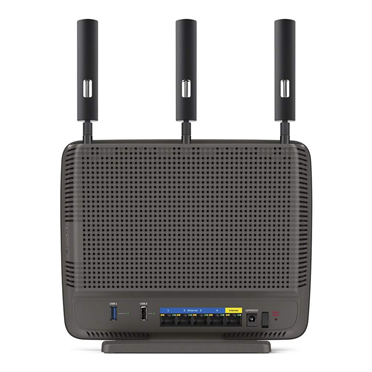 Modern routers also support the 802.11 ac wireless standard and MIMO which provide faster WiFi performance. We currently use a LINKSYS EA9200 TriBand router. It has two 5 GHz transceivers. You can use the two transceivers to provide less congested channels within the pressbox. Provide more robust recovery from network disconnects. Game Data Live can utilize File Transfer Protocol (FTP) servers and also HTTP WebDAV servers. Routers can provide access to a storage device connected to their USB port through use of the File Transfer Protocol. 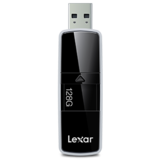 We have used a USB-3 flash drive from Lexar as the storage device to create an FTP server within our router. We've tested a variety of USB flash drives. 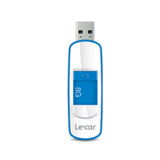 You can transfer a video file 1 second faster with a high performance USB-3 flash drive compared to a basic USB-3 flash drive. Although it takes some effort to setup, using your router as an FTP server for the cost of a flash drive provides huge advantages. You can use a laptop as a server. Laptop servers are usually faster than a flash drive attached to the router. We have used Apple's OS X Server ($20) for this purpose. You can also use an HTTP WebDAV server (WebDAVNavServer) on your Macintosh for free. If your Macintosh server is also capturing video using Game Data Live, you can cut the video file transfer time nearly in half. You can also purchase a dedicated file server. We use a My Cloud EX2 Ultra from Western Digital. It supports FTP and WebDAV. Depending on the stadium, its sometimes handy to put the router and the server in the press box (with the coaches) while you're capturing video from another location. Access Points are basically WiFi radios that you can attach to a router using an ethernet cable. You can use Access Points to provide a stronger WiFi signal to remote devices and to add WiFi channels to your network (fewer devices per channel). You can improve network speed and reliability with Access Points. Access Points are configured using a web page provided by the access point - similar to setting up a router. Access Points provide security and access control similar to a router. 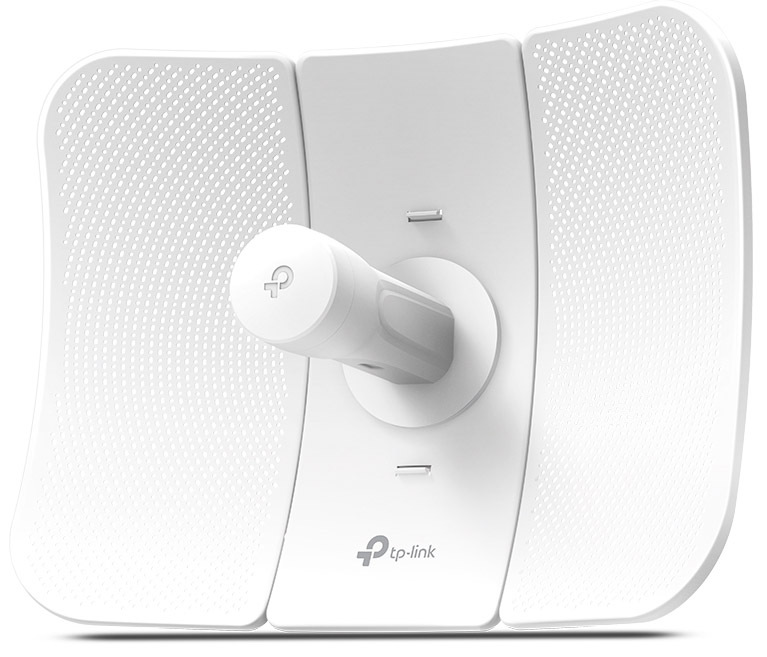 TP-Link provides a directional access point that can be mounted outdoors. The TP-Link CPE510 supports the 802.11 N networking protocol and MIMO. The TP-Link CPE510 has an ethernet port. You use that port to connect a CPE510 to your router. The TP-Link CPE510 transmits most of its power in a beam that is 45 degrees wide. Multiple CPE510s can communicate with each other using a proprietary protocol that cell phones don't recognize. Older CPE510s have 2 ethernet ports so you can connect to two devices. The TP-Link CPE510 comes with a power over ethernet injector to provide its power over its ethernet cable. You can mount the CPE510 remotely and not worry about availability of power at the remote location. Mounting the CPE510 high on your pressbox gives it a clearer path to the sideline. We have built several inexpensive mounts for the CPE510 using PVC pipe and cable ties. With this example, we can point the CPE510 right at the sideline. We have transmitted 720p HD video (1280 x 720 resolution) to the sideline using the TP-Link CPE510 mounted high on our press box. We have also transmitted 720p HD video across the field to the far sideline at opponents' stadiums. TP-Link also has a CPE610 that provides more transmit power and a more precise beam width (9 degrees). This device works well in the endzone. It also uses the same software as the CPE510 - so its relatively easy to setup. It uses a similar power over ethernet injector. We used one of these in the endzone for 7 games in 2018. We finally get video from the endzone reliably thanks to the CPE610. It can be aimed very precisely using the signal strength indication in its web browser based setup. We have used a LINKSYS LAPAC-1750 wireless Access Point where its not raining. This access point can be used to add a high performance channel to your network. 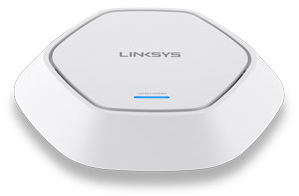 The LINKSYS LAPAC-1750 access point supports the latest wireless protocol - 802.11 ac (faster) and MIMO. 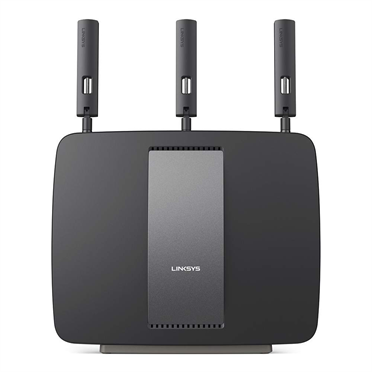 We also have a LINKSYS LAPAC-1200 access point that provides the same features as the 1750 with less bandwidth for less money. Frankly, the 1750 is more than you need. 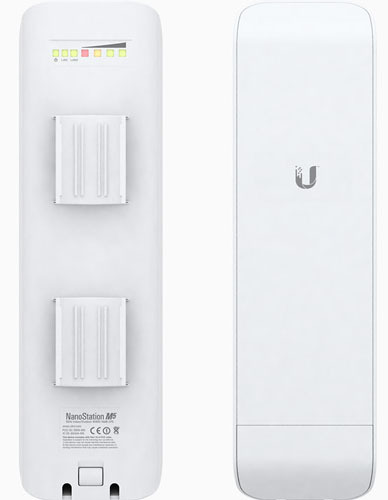 We have tested a NanoStation M5 (Access Point) from Ubiquiti Networks. Its very similar to the TP-Link CPE510 and has been used by a couple of our competitors. It can be faster than the TP-Link. Its web based user interface is frustrating to use. It may put out more power than the TP-Link CPE510. Its instructions include an RF Exposure Warning that suggests you stay 2.52 meters away from it. Our simple sideline configuration is shown below. 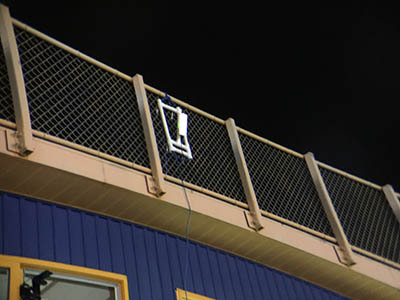 It includes a router providing WiFi in the press box with a flash drive acting as an FTP server and a TP-Link CPE510 mounted high on the press box pointed at the sideline. You can construct inexpensive mounts for the CPE510 from PVC pipe. Wireless networking within the press box can be challenging. Interference comes from cell phones, laptop computers and other WiFi networks. Given years of experience with Game Data Live, we suggest you use wired networking where ever practical. Macintosh laptops can easily network using ethernet cables at gigabit speeds. Apple has provided a wired ethernet solution for iPads and iPhones so you can network without interference. 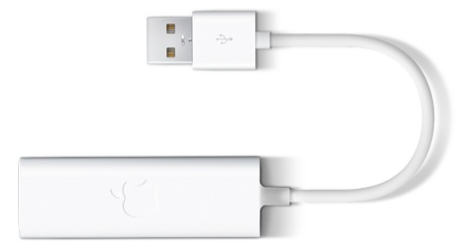 You can combine Apple's Lightning to USB 3 Camera adapter ($39) with their USB Ethernet adapter $(29) to get a RJ45 ethernet port for your iPhone or iPad. You will need to provide power to the USB 3 Camera adapter with an iPad power supply and its usual Lightning cable. This can provide a fast and reliable link from your camera (iPhone or iPad) to your Game Data Live Network. You could also use it for coaches iPads in the press box. The biggest challenge you face when implementing WiFi in your stadium is the interference you get from all the cell phones in the stands. If it is easy to do, you should run an ethernet wire from the press box down to the sideline and position an Access Point there. Its usually not easy to do. You can also build a Two Tier Network to the sideline. If you have a TV on the sideline, you can attach the network devices to the TV and get power from the same source you use for the TV. Our Two Tier Network consists of TP-Link CPE510s providing the long distance tier of the network. The short distance tier (in the pressbox and on the sideline) is provided by traditional routers, access points, Mac laptops / iPads / iPhones. The long distances are covered by strong directional devices pointed at each other providing a robust connection in both directions. The short distance devices transmit in every direction. We still have our CPE510 on top of the press box configured as an Access Point. Another CPE510 on the back of the TV is configured as a Client and connects to the press box Access Point. The long distance tier provides a strong connection to the sideline that is almost as good as using wire. We attach a LINKSYS LAPAC-1200 Access Point to the Client on the TV to distribute the WiFi to iPads on the sideline. You can make the long distance tier hidden. The Client CPE510 on the TV is not configured as an Access Point, so the cell phones in the stands do not attempt to connect to it. Once it is configured to connect to the press box Access Point, the press box Access Point can stop announcing its ID. The cell phones don't see the press box Access Point and don't try to connect to it. Video to the sideline is delivered almost as fast as video within the pressbox. Hudl, Echo and Skycoach all appear to offer a two tier network as well. You will pay less for it with Game Data Live. In 2016, we shot a second camera angle using an iPad in the end zone. It connects to our long distance tier using another CPE510 set up as a client. We're shooting wide from the press box and tight from the endzone. Video clips are viewed by the coaches in Wide and then Tight order. In 2017, we used a Macintosh laptop capturing video from our normal endzone camera. The Mac was wired to a CPE510 as well. The normal endzone camera has lots more zoom than an iPad. Recording for the endzone camera is triggered from the press box. We get better video with fewer camera operators. In 2018, we're using a TP-Link CPE610 in the endzone to create a more reliable network. 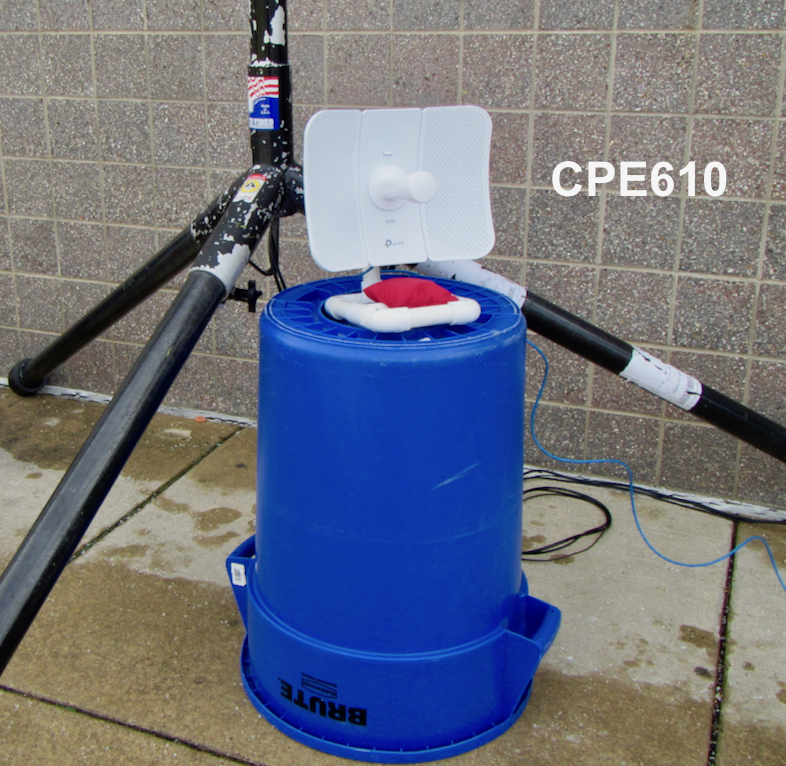 If you're having trouble getting a signal from the endzone, the CPE610 can help you out. We currently point our roof top CPE510 directly at the TV on our sideline and point the CPE610 in the endzone at the roof top CPE510. That provides a strong signal to both locations. We have also used the CPE610 while shooting video from the opposite side of the field. The TP-Link devices are configured to use TP-Link's MaxStream proprietary protocol. The MaxStream protocol ensures that the CPE510 on the sideline and the CPE610 in the endzone share the bandwidth to the pressbox efficiently. Cell phones can not connect to these devices while they are running MaxStream, so it also helps eliminate cell phone interference. We're using MaxStream for the long distance tier and standard 802.11 ac for the short distance tier in the press box and on the sideline. An IOGrapher iPad Case lets you add a 2 X telephoto lens to your iPad or iPhone and mount the whole thing on a tripod or monopod. Check them out at www.iographer.com. A Quik Pod monopod can be used with the IOGrapher case to stabilize and support your iPad or iPhone. It has a quick release so you can separate iPad and Quick Pod in a couple seconds. Monopods can be purchased from IOGrapher, BestBuy and Amazon. A Game Controller can be used with Game Data Live for iPad or Macintosh to control video playback. We have used the "Nimbus" controller from "steelseries". We use the game controller with our TV on the sideline. It lets you step back from the TV as you review video without holding a laptop. You can operate it with gloves on. The laptop can also be concealed to keep it out of the weather. 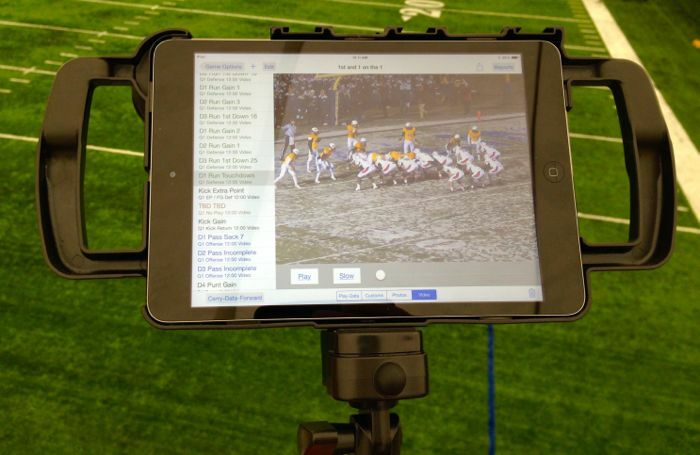 You can implement sideline video with Game Data Live for under $500 including an IOGrapher lens. That includes 2 iPad software licenses, 1 router, 1 flash drive, 1 CPE510, IOGrapher case + lens plus ethernet cables. You can implement sideline video with Game Data Live for Macintosh using a Magewell framegrabber and an iPad on the side line for around $600. That includes an iPad software license, a Macintosh software license, file server software (free), a router, a CPE510, the Magewell framegrabber and ethernet cables. Build it Yourself - Robust network - No Annual Fees. Optional Western Digital "My Cloud EX2 Ultra" ($349) from BestBuy.